As the police, protestors and media go head to head in Baltimore over Freddie Gray’s death from injuries he sustained while in police custody—that he allegedly gave himself—it’s tough for everyone. It’s especially tough for anyone who’s been brutalized by cops. Anyone like me. I remember the first time I realized, as a black woman in America, I could not count on police protection. That night began like any other for me back then, when I was a UC Davis undergrad. I got gussied up in my denim capris, platform flip flips (I know, I know), and a halter top. I didn’t have pockets for my car keys and ID, so I gave them to a friend to hold. Later in the evening, I was in line for a party in Oakland. There were ten or so of us, and about half got in before we were stopped at the door; the function had reached capacity. The Oakland police, acting as security for the event, instructed everyone to go home. The only problem was half of my group of friends were inside the party with the car keys to go home, while the other half was outside without transportation to leave as the cops kept instructing us. Standing on the stairs in front of the building, we tried to reason with the cops, asking a black officer to allow one of us the party to find our buddy with the car keys so we could leave and find food. But the cop was adamant. We couldn’t go in. And before I could finish my sentence, the cop clocked my friend in the face, pushed her down a number of stairs and began dragging her by her two braids down the street in front of the venue. It happened in slow motion, the punch, the fall, the dragging. I was stunned, all of the sounds around me ceased. I couldn’t believe what I was seeing. When I snapped back, I saw that all of my friends were being attacked by various officers—of all ethnicities, I must add—who seemed like they’d materialized from nowhere. There was so much screaming, running and yelling as batons, fists and pepper spray flew into the night air. Immediately, I ran toward my friend and tried to push away the cop dragging her by her hair. Then he turned his attention on me. I ran as fast as my platform flip flops would carry me. He caught me from behind and began chocking me with his baton held across my neck and pulling me backward. My feet were dragging on the ground, I didn’t know what to do or how to wriggle free. Then, out of the corner of my eye, I saw my best friend charging toward the cop holding me. The officer let me go. He disappeared, like the rest of the cops involved, and probably scrambled to his squad car to escape before anyone could get their badge numbers. At first the EMTs were confused, but once they saw our faces and bruises, they let our friend inside the truck and examined her. Later, my best friend and I drove around the venue looking for the cop who assaulted me to get his badge number and report him. But he was gone and none of the officers remaining would tell me who or where he was. I went to Oakland police headquarters to report the incident but was turned away at the front desk. They said they weren’t taking reports at that time. I had nothing left to do but make sure my friends were OK, drive home and try to go to sleep. But I couldn’t sleep that night, because my face was on fire thanks to the pepper spray. It was an awful, dehumanizing experience, and it happens to people of color in America every day. I had no weapon, had committed no crime—hell, I didn’t even have pockets. 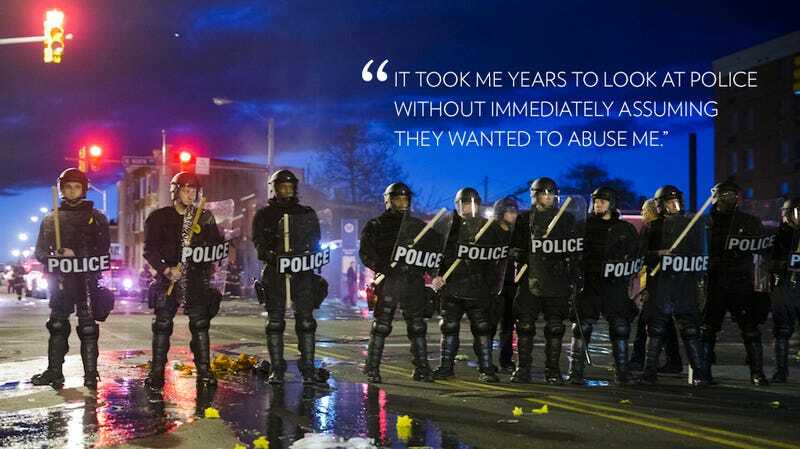 It took me years to look at police without immediately assuming they wanted to abuse me. But now, every time I see news about police brutality, a part of me has a flashback and I am furious. Furious about what happened to myself and my friends, furious about Walter Scott, Rekia Boyd, Akai Gurley, Mike Brown, John Crawford, Tamir Rice, Eric Garner, Freddie Gray and all of the names I don’t know. Have you been brutalized by the police in your city or town? Let’s talk. Or not, if you don’t want to, because if you’re anything like me, you might need a break.